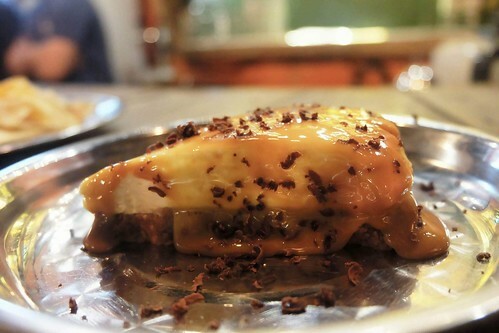 On a Wednesday late afternoon, we were in for the best Mexican x Spanish treat of our lives! Okay that was an exaggeration, or is it? 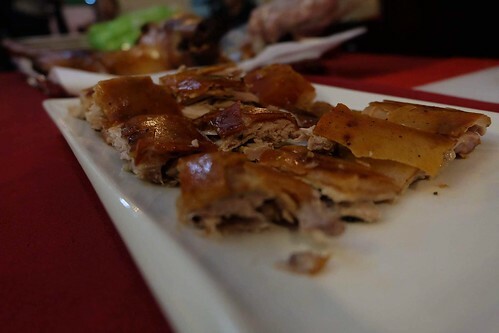 The experience was brought to us by Food Panda’s The Good Food Tour Philippines. 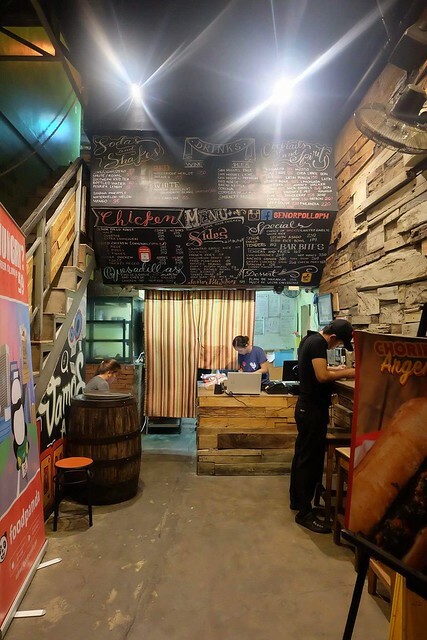 After featuring modern Filipino cuisine, the best buffalo wings, delectable desserts, mouth-watering pizzas (just to name a few), on their 7th edition, the team decided to do an Mexican x Spanish expedition along the streets of Tomas Morato, Quezon City. Paella and Sangria, anyone? Our first stop was Señor Pollo by the El Chupacabra Group. 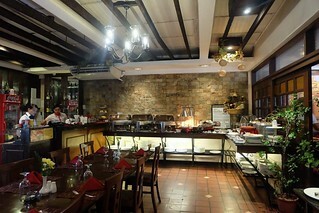 It was a two storey restaurant housed in the F7 Building along Scout Rallos Extension. Upon arrival, we were welcomed by a small, straight forward space in the first floor. 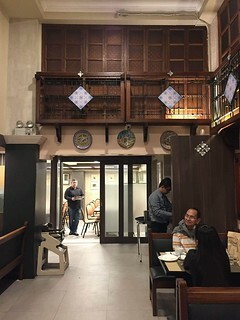 It was naturally ventilated with a huge board for the menu, some few stools and a hint of the exciting rustic ambience that awaits diners at the second floor. True enough, after the flight of stairs, we were immediately enveloped by the street artsy vibe the restaurant is going for. There were murals, mix of bricks and old wood and excited food bloggers eating their hearts away. To be honest we were a little so late for this first stop (read: Wednesday rush hour traffic), but the Food Panda team still made sure we were able to taste some of the dishes. 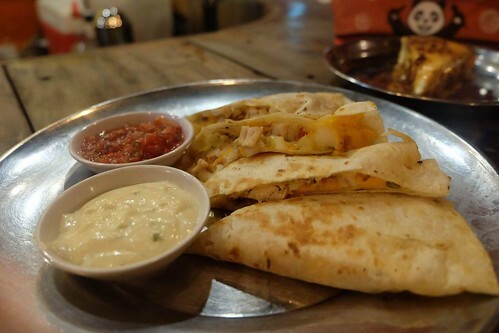 Even with the few that we have tried, we can say Señor Pollo is the place to be when craving for a Latin American fix. Bonus Tip: Be sure to pee when dining in the restaurant (try a lot of their drinks for instance) because the rest room is a must-see! If you’re a fan of spicy food this one is for you. You can taste the spicy tangy flavor every time you take a bite. Perfect for a cup of beer or an iced tea. It’s good for sharing with friends, too. Quesadilla, check. Chicken, check. 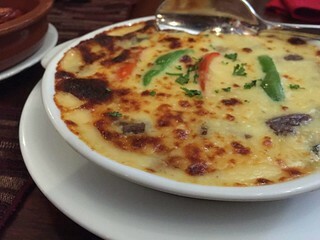 The combination of the two together with the salsa and garlic dip is a feast in our mouth. This one came out a little late as we were about to go to our next stop. Not surprisingly, after a few minutes it was gone. The texture is amazing, it’s soft and melts in the mouth. The sweetness level is just right which is how we like our cheesecake. It is the perfect sweet ending. 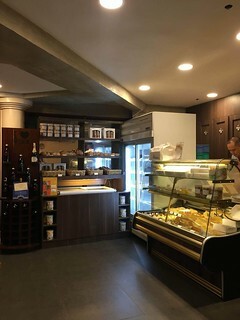 The second stop was Dulcinea at 282 Tomas Morato Avenue. 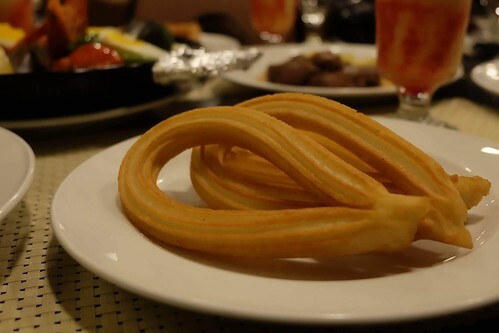 For us, Dulcinea is already a household name for Spanish food and Churros. This is not surprising since they have been around since 1963. 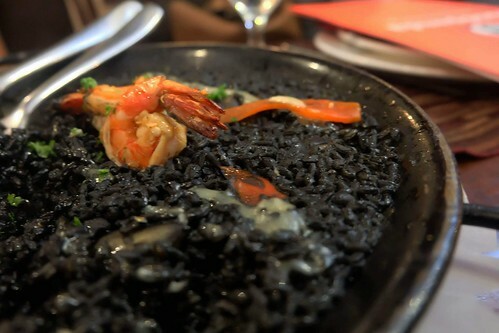 In contrast to the funky ambience of Senor Pollo, Dulcinea is more minimal and refined with a touch of Spanish-Filipino decors. The #GoodFoodTourPh group was led to the enclosed function room where the second phase of the dining commenced. One tasty dish after the other was brought to us. 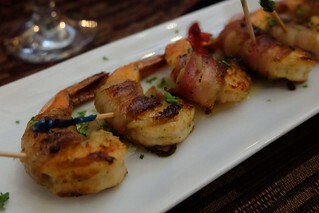 Everything was visually appetizing. Each bite was heavenly. 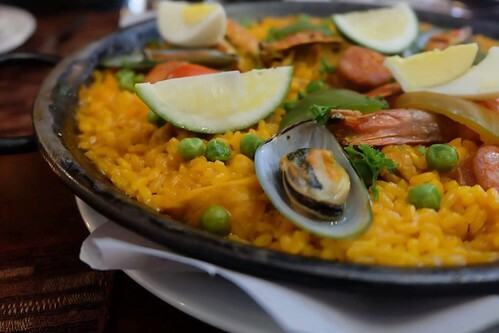 This saffron infused rice is cooked with a rich combination of chicken, pork, and seafood, topped with some shrimp, eggs, chorizo, mussels, bell pepper, and beans. It is definitely rich in flavors and spices. 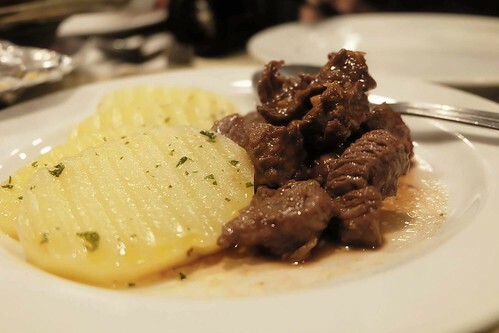 The beef is just so tender and juicy it isn’t surprising this is one of their best sellers. It is perfectly marinated in soy sauce with a kicked of garlic and spice. It’s a must-try! Pan-Seared Salmon topped with garlic and chili oil. 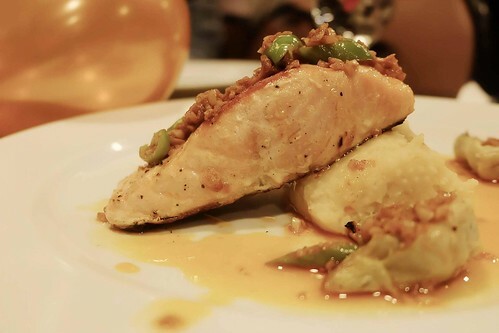 We loved the taste of salmon together with the mashed potato and roasted artichokes. 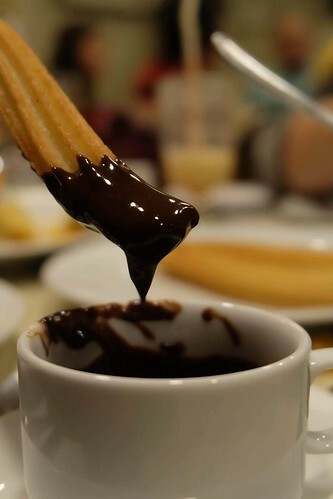 Nobody eats in Dulcinea without trying their famous Churros. We love how it is crisp and golden without a hint of oiliness. Dip it in hot and dark semi-sweet chocolate that’s so rich and heavenly you’d forget your name. 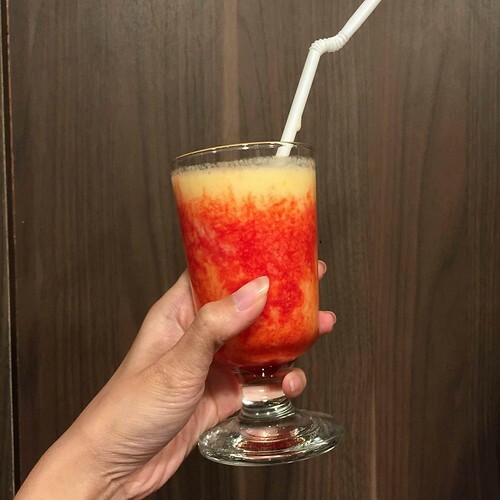 For drinks, we were treated with a refreshing blend of mango, papaya, pineapple, banana, and apple with strawberry syrup. 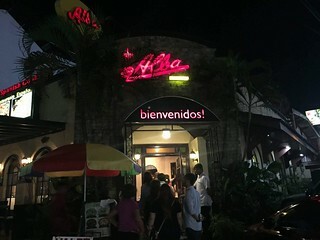 Last but not the least was the corner restaurant along Tomas Morato and Scout Lozona: Alba Restaurante. You’d think that we were already full and bloated from all the food we have previously eaten but walking in the restaurant made our mouths water again. 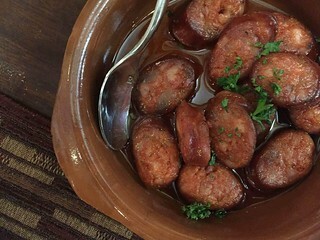 Alba prides itself as the home of Traditional Spanish Cooking. True enough, they have a buffet spread of tortilla, ensaladas, paellas, you name it. For the night though, Alba served us nicely plated meals instead so we can appreciate the dishes better. 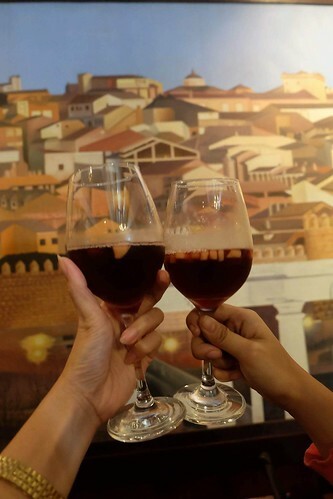 Adding to the experience was the cozy ambience of the restaurant (red napkins, wine glasses and candle light made all the difference) and the unlimited Sangria that made our hearts sing. We were welcomed with a glass of Sangria! Cheers for an awesome night, just the right sweetness with a kick. Then served with these amazing starters – Berenjenas al Horno, Chorizo Fritos, Gambas con tocino a la parilla (baked eggplant, simple cooking but taste real good), Chorizo Fritos (homemade Spanish sausage, loved the texture a little bit toasted just the way we like it), and Gambas con tocino a la parilla (grilled bacon wrapped in shrimp)! A perfect way to start the meal. Yumm! Now for the main event — Paellassss!! 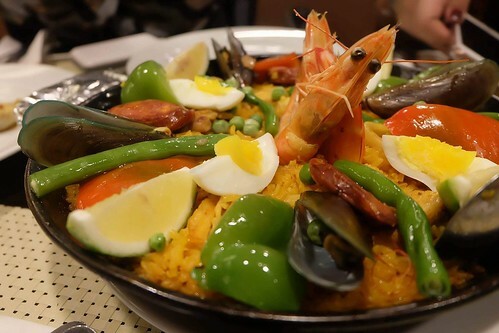 Valenciana rice dish with chicken, pork, seafood and vegetables. All in all the aroma, flavor was really good! Paella rice with button mushrooms and pesto sauce. 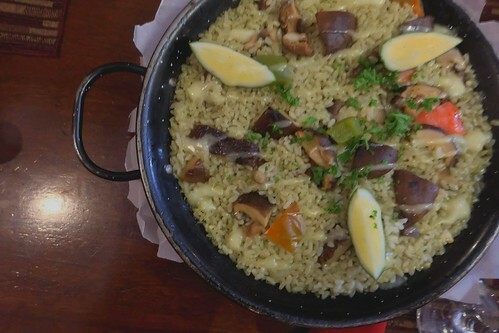 If you have an allergy with seafood or you’re a vegetarian or you just love to try something new this paella is a must! 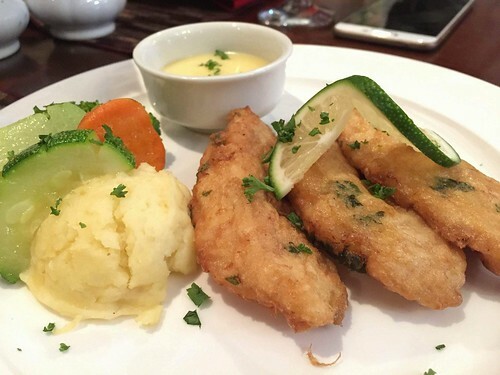 A pan-fried fillet lapu-lapu with garlic mayonnaise and a mash potato. 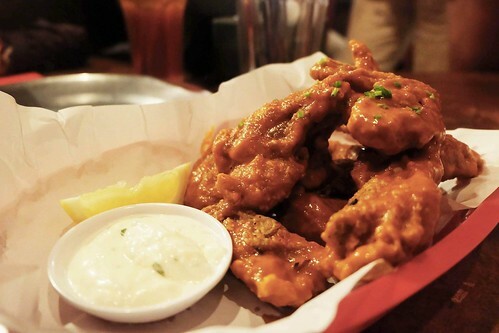 Love the taste of it together with the garlic mayo. Cochinillo Asado. This one is a must try! 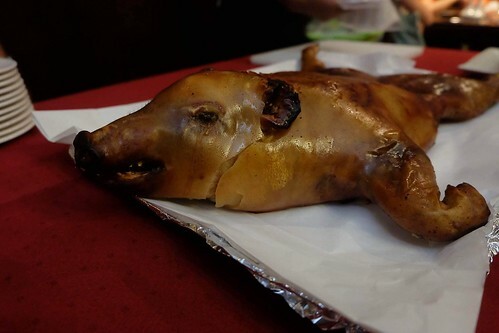 The suckling pig, was very crunchy but at the same time it melts in your mouth! We’re so in love with this! Dessert time!! OH my!! Canonigo! You are so deliciously soft! 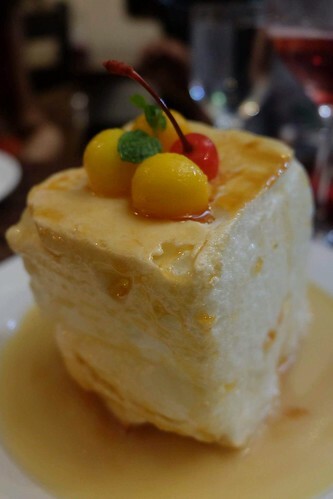 Love your sweetness and your vanilla custard sauce. Definitely a must try! The #GoodFoodTourPh Mexican x Spanish Edition is one for the books, definitely a night to remember. We were able to meet new people and try really good food. We can’t wait for the next one. The best part about all these is we can eat all of these dishes at the comforts of our own homes when the craving arises. You can, too! And we all have Food Panda to thank for it. Ahhhh, what a good time to live.